The F.A.R.T. 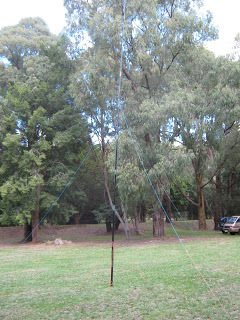 camp last weekend was a great opportunity to try out some antennas as the site had plenty of space. Some time back I published details for a 15m droopy ground plane that could be hung from a tree, so at the camp I tried a droopy ground plane for 20m built on my 10m squid pole. I used three radials, spaced at 120 degrees and at 45 degrees from horizontal. I started out with 5.5 metre lengths and trimmed the main element to 4.5 m and the radials to 5.3 m each. This returned SWR of better than 1.2:1 between 14.100 MHz and 14.300 MHz. On the same site I had also set up my trapped 20/40 m ground plane on a 9 m squid pole and my 20/40/80 m trapped dipole in a tree at about 9 metres. With three antennas I was able to do some comparison between them. I found that on 20 m the droopy ground plane was nearly always 3 S points stronger than the 20/40 ground plane and up to 4 S points stronger then the 20/40/80 dipole. All 20m signals were skip signals from within VK. On 40m I found that the 20/40 ground plane was mostly 2 or 3 S points better than the 20/40/80 dipole for skip signals, but the dipole was 2 or 3 S points better for ground wave signals. This is consistent with my earlier trials. In the next couple of weeks I will make the droopy ground plane more durable and publish some more photos. 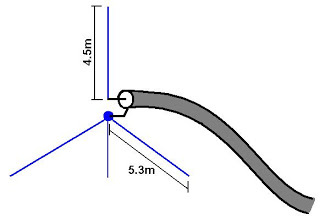 I think I have found a new portable antenna for my award chasing on 20m. The droopy ground plane is a little harder to set up than the trapped 20/40 ground plane but the extra 3 S points could make all the difference. This entry was posted in Antennas, SRESU. Bookmark the permalink.